We are located in the Wadden Sea National Park in the quaint little village V.Vedsted. Close by Denmark’s oldest town Ribe, mudflat, forest and beach. If you like natural beauty, this is for you. 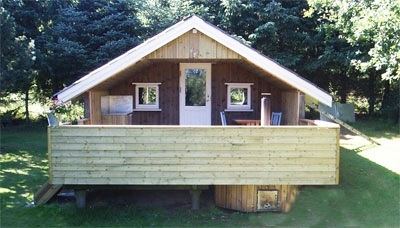 We have a cabin for two people and a room for two people, there is a large garden to run around in. In the hut there is a built-in wildernessbath that you can use for a fee, and enjoy a quiet evening. There are plenty of opportunities for experiences, not far from here. Both summer and autumn. Walking and cycling – black sun – oyster tours – bird watching – experiences in Denmark’s oldest town Ribe, and trips to the scenic island of Mandø. It is possible to rent a bike. It is possible to order dinner. Shared toilet and bath inside the house. It is possible to put up a tent by agreement.